You no longer have to go to an Indian restaurant to enjoy a bowl of delicious dal makhani. This pressure cooker dal recipe is quick and easy to make in an instant pot! 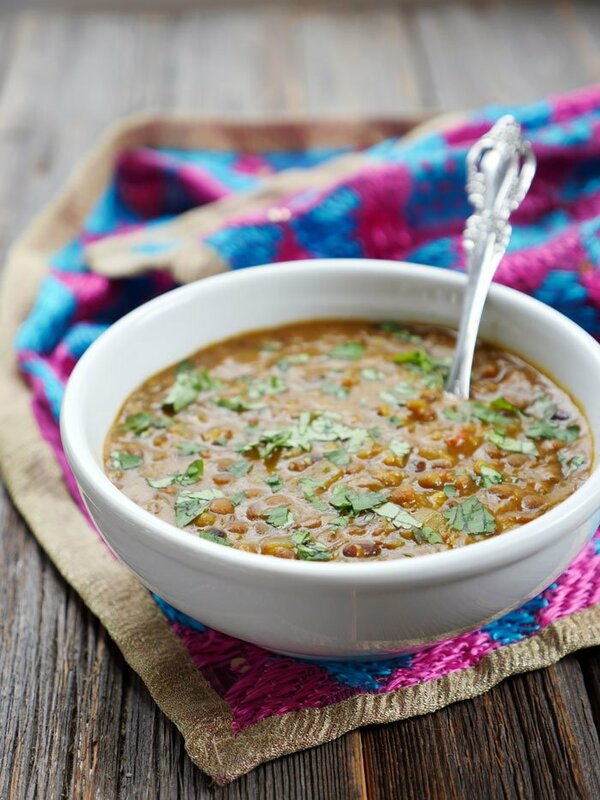 This popular Punjabi dal is so easy to make in an instant pot! 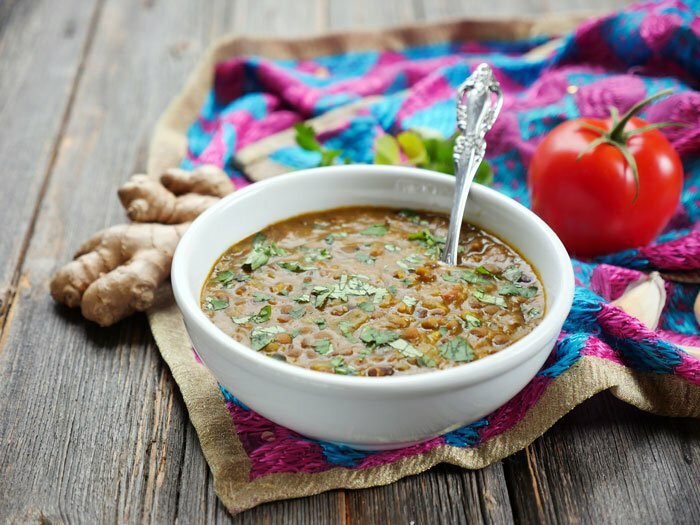 Dal makhani is rich and creamy dal recipe that calls for a combination of lentils: whole lentils that maintain their texture and split lentils that melt together to form a creamy dal. Stir some ghee into the soup before serving to give it a rich buttery flavor and you’ve got the perfect bowl of soup. I’ve been eating dal makhani for as long as I can remember. I was a pretty picky eater as a kid but when it came to eating those buttery lentils – I was always on board. One of my favorite meals: dal makhani, roti, spicy achar (pickle) and dahi (yogurt). So simple but so tasty. Just thinking about that meal makes me nostalgic. Speaking of nostalgia, that’s pretty much the whole reason I’m even sharing this recipe. My mom makes the best dal makhani and right after I got married, she made sure to share her recipe with me. By her recipe I mean, “Ash, just use a pinch of this, a handful of that and a few scoops of this.” In the past, her directions would overwhelm me… but now I think I’ve got the hang of converting “mom’s measurements” to actual measurements (#IndianGirlProblems). Even though mom’s cooking is always the best, I have to say this dal makhani is absolutely spot on – or “on fleek” if you’re a millennial like me (even though I feel super awkward and a bit too old using that phrase IRL). The best part is, you can make this in your handy dandy Instant Pot – a magical electronic pressure cooker that’ll have the dal done in no time at all. Trust me, this dal is restaurant-quality for sure. If you can tolerate rice or grassfed yogurt, then I highly recommend serving this dal alongside those two things. If not, make my paleo roti or paleo naan recipe. Soak the lentils in cold water overnight. Drain, rinse and set aside. Press the sauté button on the Instant Pot, add the oil and allow it to heat up for a minute. Add the cumin seeds and once they start to brown, add the onion and bay leaf. Stir-fry for 6-7 minutes or until the onion begins to brown. Add the garlic, ginger, spices and stir, then add the tomatoes. Cook for 5 minutes, or until the tomatoes break down. Add the lentils to the pot along with the 3 cups of water and mix well. Stir in the ghee and garnish with cilantro if desired. Feel free to add more ghee to this recipe! Ghee is what gives this dal its delicious buttery flavor. You can also add a bit of heavy cream if you prefer! I only have Moong and Masoor daal at home…. will those work? This recipe couldn’t be any easier or tastier!! I had it with the paleo naan… so delicious! Sounds amazing! How long would you cook it if using a crock pot? I don’t have a pressure cooker. Thanks! Jessica, I haven’t tried making this with a slow cooker yet but I’d guess 4-6 hours on high or 8-10 hours on low. If you try, will you please let us know? Do you use equal proportions of each of the three types of lentils? You mention tomatoes in recipe instructions but not in ingredient list. ?? Do you use fresh? Canned? Hi, they are in the ingredients list too 🙂 It says 2 tomatoes, chopped – I use fresh. Do you have to soak the beans overnight, or could you cook them in the instant pot first? Well, I don’t have 24 hours before serving, so I guess I will try it and find out! This recipe looks wonderful. I don’t have an Instant Pot, how long would you cook with a regular electric pressure cooker? Would you use the high setting? Thanks so much. I make this recipe at least once a month for my family! A few changes since I’m vegan, but that’s mainly to leave out the ghee and use a bit of cashew milk to finish. Thanks for a great recipe! Kristi, I’m so happy to hear that you like it! Literally my first attempt with the instant pot and it was so easy and turned out great! I haven’t tried this recipe yet, but I did sit down and do an approximate carb break-down of it for anybody who’s interested. I came up with a total of 71g carbs and approximately 20.6g fiber for the entire recipe, so 50.4g net carbs. If you do this as 4 servings (I didn’t see a number of servings mentioned but that’s what I’m going to ballpark it as) that’s about 12.6g carbs per serving. I’m on a low-carb diet and I’m definitely looking forward to making this as a treat! I love dal makhani so so much and I was worried I’d never be able to eat it again, so thank you so so much for posting this recipe! I don’t have a Instant Pot or a pressure cooker, so I’m going to try it out in a crock pot/slow cooker. So I am making this tonight. Put the lentils to soak overnight. I will let you know how it turned out. Going to serve it with cauli rice and plantain rotis. I don’t usually soak red lentils or moong dal(split mung beans) what happens if you don’t soak? Because they are not whole lentils,right? Will they work? I don’t have black lentils. 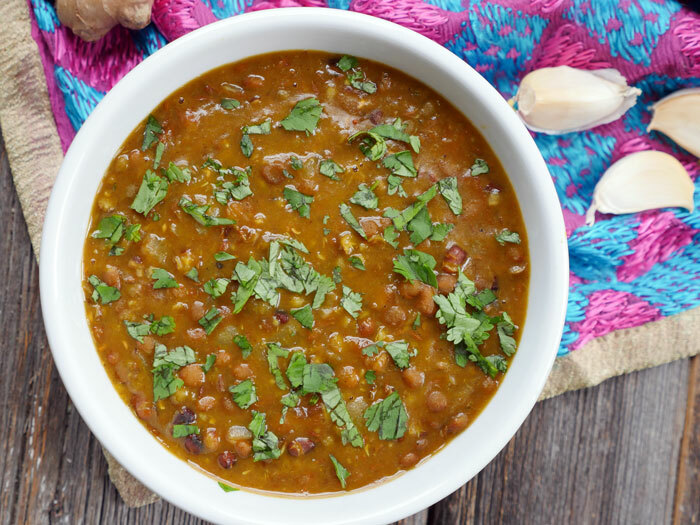 Linda, you don’t have to soak the split daal – I keep these three types of lentils mixed together in one big container so it’s just easier for me to soak them all at the same time. Thanks so much for a great recipe. This is actually the first recipe I used in my brand new Instant Pot! I made the following modifications: 1/3 c french green lentils (didn’t have black lentils), 1 regular sized can of diced tomatoes instead of 2 whole tomatoes. I will say the 1tsp of cayenne was very spicy, but my boyfriend loved it! The ghee at the end transformed this dish into pure luxury! I can’t wait to try more of your recipes. I’m so glad you liked it!! Hope you’ll let me know what else you try from the blog! Nice recipe, would like to see it fully adapted to the Instant Pot to avoid having to soak the lentils overnight or for 24 or 48 hours or whatever. The Instant Pot is supposed to speed up and simplify cooking, not make it longer and add steps. You can always skip the soaking part and cook it longer if you want. I soak lentils to reduce phytic acid – according to this article by Chris Kresser, soaking legumes can remove 30–70 percent of phytic acid. Also, it cooks pretty quickly and in a single pot, so it’s still faster than traditional cooking methods imo. Hi! I am so great full for finding this site for Indian recipes using instant pot!! I just bought one and I am looking forward to making healthier meals for my family. I will be trying this recipe tonight! By the way, Would you happen to have a recipe for rajma?? Thanks for this website and I am looking forward to more of your instant pot recipes!! Hi Rhoda! Glad you found my website too 🙂 I don’t have a rajma recipe using the Instant Pot yet, but I’ll add that to my list of things to make! I wanted to offer up a comment to the “soaking the lentils overnight” issue. I made this recipe (or one very similar to it about a month ago) and it turned out just ok. A good friend of mine who is from India and has been using pressure cookers since way before the IP was around said that regardless of the fact we are told there is no need to soak the beans for Dal, it just turns out better if you do. I’m soaking my lentils (combination of whole black lentils – Urud – and some split red lentils) and will let you know how the consistency compares to non-soaking. Perfect, we loved it! I didn’t persoak my beans otherwise followed the directions and it came out perfectly done and flavorful. Loved this recipe. I had tried other recipes, but this was simpler, easy to follow and turned out great. Thank you! I’m planning on trying this next week, would subbing ground cumin be totally crazy (new to cooking Indian food) I always have it in the house. Just dropped in to say thank you for this delicious recipie. I’veven just tried it on my brand new instant pot. It was my first experience with pressure cooking, which turned out quite successful. I was bit hesitant to buy a pressure cooker, due to various accidents we hear, but I think it’s quite safe, if we follow the instructions. I’m going to try other ‘desi’ recipes too. I wonder if you’ve got one for mutton karhai? I am in love with most (if not all) of your recipes and have tried many already: the n’oatmeal bowls and naans have even become a staple in my house! 🙂 I just got myself an instant pot and I am loving it, but i am quite new to cooking with it. I can’t wait to try this recipe but I have one, perhaps silly question: when you say one cup of lentils, soaked overnight, do you mean one cup of dry lentils – which are then soaked and thus increased by weight – or one cup of lentils equivalent to cooked lentils – which will obviously be much less lentils due to all the absorbed water? thank you so much for all the inspiration and delicious recipes!! Hi Sarah! Glad to hear you like my recipes 🙂 There are no silly questions! I mean one cup of dry lentils (which are then soaked overnight) 🙂 Can’t wait to hear what you think of the recipe! Thank you so much for posting this recipe. My son and I made this for our lunch today. It turned out fantastic! Can you make this with canned lentils? I made this last night with my stovetop pressure cooker. I cooked it on high for 7 minutes with a quick release after soaking it for almost 18 hours. I didn’t click on the black lentil link in the recipe and used beluga lentils (whoops!) with red and mung beans instead and it still turned out great! We aren’t paleo, so I served it with some pressure cooked white rice and yogurt and my kids 7,5, and 2 loved it (I did leave out the cayenne). We aren’t Indian, but kids are always suckers for Indian food and we love your recipes. Katie, that’s great to hear! I’m so glad your kiddos liked the recipe!! Thank you for sharing your mom’s delicious recipe. I love lentils but every time I make them, my kids start moaning and groaning. Not tonight – everyone gobbled them up! Hi Alli! Wow, that’s so great to hear!! Thanks so much for letting me know how it turned out for you all! I made this vegan by substituting Earth Balance in place of ghee! It turned out great but definitely a bit thin. Thickens up nice with flour but will use less water next time. Also, the “print” icon on the recipe appears to be broken! Would just green lentils work? How many servings is this would it feed 5 if served with rice and a vegetable? Yes, I’d suggest doubling the recipe to be safe – and if you have leftovers, just freeze what’s left for a rainy day. I do this all the time. Hope that helps! I’ve heard with the IP you don’t need to soak lentils or other beans. Have you tried that? Urad dal and mung I would sure soak. Would I soak the red lentils that long too? Want to make this today! I soak everything together because it’s easier and it turns out just fine – the red lentils are going to “melt” while cooking anyway 🙂 Let me know what you think! Which Brand and model instant pot(pressure cooker) are you using. Hi, I love your recipes and am looking forward to making this one. I can’t seem to find the amount of tomatoes needed in the recipe. Did I miss it? Hi Mara, this is probably too late of a reply (my baby keeps me so busy! ), but I really hope you were able to save the dish! You can add potatoes to the dish! Or try topping it with some sour cream. And if you want to make a second batch then just leave out the salt the second time around and combine the two batches. This smelled wonderful. I soaked the whole lentils for 24 hrs and then followed directions but it turned out watery and just isn’t very good. I’m so bummed. Not sure why that happened. Any suggestions should I attempt again? Don’t soak? Or soak and less water? Hi Rebecca, I’m surprised it’s watery – did you dump out the water the beans were soaking in and add fresh water when cooking? Also, give it a little time, lentils continue to thicken after they are cooked. If they do thicken, add ghee when serving for more flavor. Please update me and let me know how it turns out! Thank you for responding. I did soak and then drain them and use fresh water for cooking. I did notice the lentils absorbed the water they were soaking in so maybe that was the problem. And as you said, it did thicken up but the taste was watered down. I will try again though because the base smelled wonderful. Maybe I’ll try a different brand of lentil too… Thanks! Hi. Can you explain how to soak the lentils? When I google it, most sites I see say don’t soak more than 12 hours. Some suggest changing the water, etc. When you add the water to soak them, do you refrigerate that until it’s time to cook? Do you change the water? Should it be airtight? Sorry to be so clueless! And thanks for the great recipes! Your butter chicken is now a staple for our family! Thanks! Thanks so much, Hannah! I’m so happy to hear that you liked it so much 🙂 And I love the additions – I’ll have to try that the next I make this! May I ask if you have a 5, 6 or 8 qt Instant Pot? I am trying to determine based on cups of ingredients/cans of beans, from multiple recipes, whether I would need the largest size in order to fit all of the ingredients. I have the 6 quart but I plan on buying the 8 quart next 🙂 This recipe will definitely work in a 6 quart though. Do you mean a cup each of split and whole lentils or a cup combined of lentils? This is for your recipe Instsnt Pot Dal Makhani. Hi Dal, you just need 1 cup total (combination of whole and split). Let me know if you have more questions! I don’t know if I posted my question properly. Does your recipe mean a cup each of whole and split lentils or does it mean one cup if combined lentils? thank you for sharing this recipe. I;ve made this multiple times and its been a hit everytime. This was just incredibly delicious and authentic- as was your roti I made to accompany it. My husband said it was delicious about 15 times, and he is usually always very unenthusiastic about “vegetarian night”. Im not Indian but he is, and I quickly fell in love with Indian food when introduced many years ago. When we adopted a somewhat paleo- 100% gluten free lifestyle, so many Indian staples were off the table. I am just so excited to have found your site. Thank you for sharing your recipes! Amy, that makes me so happy to hear!! And lol – my husband isn’t a fan of “vegetarian night” either haha! I hope you’ll let me know what you both think about any other recipes you try/like! I thought I followed the instructions but what I ended up with looks more like a watery lentil soup rather than a dal. Am I not using the Instant Pot correctly? How can I be sure it is sealed and pressurized while cooking? Thanks. Was the vent set to sealing? Were the lentils cooked? The Instant Pot I just bought doesn’t have the bean/chili option. Should I use the soup/broth, meat/stew, or multigrain button? Just discovered this site and am so excited for more indian recipes! Hi Johanne! You can use the manual button and set it to 30 minutes. Hope that helps! Can’t wait to hear what you think! I don’t have an instant pot but do have a CrockPot. Can I use it for this recipe but cook it longer? I LOVE this. Our most-used cookbook has been Anupy Singla’s Indian Slow Cooker, but we just got out of the habit. Since we got an Instant Pot, I’ve wanted to make some Indian legume dishes. This was the first one I’ve tried, and I’m making it again today, three days later! Thank you for sharing. Andrea, I’m so happy to hear that you like this recipe 🙂 Thanks so much for letting me know how it turned out for you! I turned here for my very first Instant Pot recipe and it was amazing!! I didn’t have time to soak the lentils so I threw them in dry and cooked for 30 minutes, and let sit on warm for another 30. Just perfect! Thanks so much. Andrea, I’m so happy to hear that this was your first Instant Pot recipe and that you liked it so much 🙂 Thanks for letting me know how it turned out for you! Hi – is the recipe above for 2 or 4 people? Hi Sachin, it will serve 4. I just updated the post with this info – thank you for asking! Made this today and it turned out so good! A couple of changes that worked out well- I did not soak the whole lentils before cooking, decreased the water from 3 cups to 2.5, added a diced potato, 3 chicken thighs, and ground cumin instead of cumin seeds. Hearty, full of flavor, and lots of delicious leftovers to look forward to! Thank you so much for the recipe. Ashley, after buying Instant Pot, the first recipe I tried was your Dal Makhani (I used chana dal, whole moong, and whole masoor), and it turned out sooooo good that I found myself eating some of the leftovers for breakfast! 🙂 In the past, I could never perfect it on the stove, but the texture and taste in this recipe is just wonderful – thanks so much!.. Irene, that is awesome! I’m so happy to hear that 🙂 Thank you for letting me know how it turned out for you! I got my Instant Pot a couple weeks ago and have made one or two of your recipes already. I am eating this dal makhani as we speak. It is delicious! I doubled the recipe (to have enough to freeze). I used 1/2 cup each of split red lentils, whole urad dal, whole moong dal, and small red kidney beans. I used a whole 28 oz. can of diced tomatoes and doubled most of the ingredients (a little less than 6c water). It came close to the half-full line on my 6Q Instant Pot. I got busy with work, so it sat keeping warm for longer than I planned, but it turned out beautifully. Thank you! Jason, that’s so great to hear 🙂 Thanks for letting me know how it turned out for you! Hi!! I really can’t wait to try this one out. Question for you about the lentils, though. Anytime we’ve used red lentils, they disintegrate. Wouldn’t soaking them just make them fall apart overnight? I’m cooking for 8, if I double the quantity of everything, do I double the cooking time too? The taste is fabulous, but it’s rather runny – should I strain it or try to reduce the liquid on sauté? Thank you for posting the recipe. Instead of ghee or dairy have you tried non dairy milk ? This was my first recipe in my new Instant Pot (after years using a Fagor multicooker, so not a total newbie ). We loved this. It was thicker than some dal recipes I’ve tried and had perfect spice, as usual. I did add a package of chopped spinach and traded a small jalapeno for the cayenne. I have to say I’ve tried many of your recipes and every one has been amazing. Thank you! Cyndi, I’m so happy to hear that you loved this dal! And even happier that you’ve liked every recipe of mine that you’ve tried!! Can I use the black split urad dal and kidney beans? Would cooking time be the same? This was my very first Instant Pot recipe, mostly because all I needed to buy for it was the Garam Masala. I used all red lentils (because that was all that we had in the house) and even though they mostly melted away, the flavor and the texture of this turned out amazing! I was literally eating it out of the container I was trying to put it away in! Thank you for a great recipe! That is awesome!! Love that you were eating out of the container lol 🙂 Thank you for letting me know how it turned out Brandy! This was easy to make and quite good! I used 1/2t cayenne and it has some kick! A very good fish and it looks so nice too. Made it as described, except that I did not presoak the lentils, and I had to sub 1/2 canola/1/2 butter for the ghee as I don’t have any. I adjusted the seasoning at the end with a little salt. Otherwise it was fabulous! Made a ton and lentils were perfectly cooked without the presoaking- I did do a full natural release though. Thanks! Hello! Thank you for such great IP recipes! Can avacado oil be substituted with anything else? Thanks! Hi Meagan, you can use any neutral flavored fat – butter would be good! Attempted the soaking of the lentils and unfortunately it produced shoots which looked to much like aliens to me (although I have been told this makes them even more nutritious) so due to a lack of time I did the recipe skipping the soaking and the dhal came our perfect!! Made it for my husband’s rather large punjab family and they all loved it too. Going to try the saag receipe next as it’s one of my favourites. If they produced shoots, I am guessing you soaked them for longer than a day? That is impressive lol! But glad you liked it 🙂 Let me know what you think of the saag! I enjoyed the flavor, but my Dal came out way more watery than anticipated. Was I supposed to use a total of one cup of Dal? And 30 min seems excessive for pressure cooking. My normal Indian pressure cooker would do the same in less time. Thanks! Hi can you just use red lentils alone for this dish or is it important to use a blend? I have canned kidney beans but if it’s just 1 cup total thought maybe I would just use red lentils. Thx! I made this last night and it was amazing! Best dal I’ve ever made! Even the husband thought so. The flavors were divine and wasn’t too watery or too thick – just perfect in every way. I actually didn’t soak my lentils for too long (scatter-brained me forgot) – put them in water around noon and cooked them around 7pm. Still came out fantastic. Thank you so much for sharing your recipe with us! I’ve made this twice with an addition of cream at the end… and it is so good. I deviated yesterday and used someone else’s recipe… fail. Your recipe is the clear winner. Thanks! Aliyah, happy to hear that you like my recipe 🙂 Thanks for letting me know how it turned out for you! I can’t wait to make this! Question: if I wanted to double the recipe, do I simply double amount of lentils and water? What about the spices and tomatoes, etc.? Thanks so much! Bea, if you want to double the recipe then double all of the ingredients 🙂 You can keep the cook time the same though! Made it tonight with soaked whole mung beans and splitted red lentils. It was amazing! Will make it again and again for sure ! Topped with pickled red onions and salted yogurt, yummy! My husband made this in 8 minutes and he said it was great. Is there a reason why the recipe calls for 30 minutes? That’s awesome! 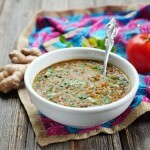 It takes me 30 minutes to get the dal cooked the way I like it – maybe he used all split lentils? If it worked though that’s what counts! Stephanie, I’m so glad you liked it! Super delicious! This was a huge hit with my family. I do have a question, though: My husband would like this spicier but I want to keep it mild for the kids. Besides making two pots of dal to accommodate him (which I may do! ), do you have any suggestions on spicing it up at the table? Thanks! This was the first Indian food I ever ate and the first I learned to cook at home. I love it and it loves me. Thank you, Ashley, for making it possible for us to learn to cook these foods at home. And of course, thanks for making things InstantPot-friendly. I made this last night in the IP. It was my second recipe and it was delicious! I added the ghee and it was so incredible it was eaten before I even realized that I forgot the cream! My husband and I love leftovers to bring to work the following day. How much water would i use to double this recipe? Thank for you this delicious and easy recipe! Kyema, I’m so happy to hear that! Thank you for letting me know how much you liked this recipe!! To double the recipe, double all of the ingredients but leave the cook time the same 🙂 Hope that helps! I really liked the recipe. I made my own additions. 1/2 tsp of black mustard seeds, 4 dried kashmiri chilis, about 10 fresh curry leaves (instead of bay leaves), 1/2 tsp of fennugreek seeds. 2 1/2 cups water. put the mustard seeds with the cumin seeds wait for popping. Add the chilis with the rest of the spices as well as the curry leaves. Add the fennugreek seeds with soaked lentils. I really liked the variety of lentils in this dish just felt like it was missing a little flavor from I am used to. This sounds like a brand new recipe… did you try it the way it was written first? This was amazing!! Followed it perfectly, but I made 1.5X the recipe!! Hello! I’m new-ish to the instant pot (but thanks to Indian mom quite familiar with pressure cooking) and I love the IP because I can set it up with a timer in the morning before work. Would this strategy work with this recipe? So the dal would soak all day rather than overnight? Just found your blog and looking forward to trying your recipes! Thanks! How much onion masala would this recipe use? I’m guessing around one cup, but I wanted to check! I have made this probably ten times, and every time is perfect. I didn’t know I was into vegetarian recipes until I started looking into curries with beans and lentils! I absolutely love this one. Lee, I’m so happy to hear that!! Thank you for letting me know how much you like the dal makhani 🙂 Also, love the baked tofu topper idea – I’m going to have to try that! This sounds delicious – but isn’t Dal Makhani made with urad dal and rajma only? Not mung dal, red lentils, massor dal etc? Using those other lentils will make a delicious dal – but I’m not sure I would call it Dal Makhani. Am I wrong? Nope, dal makhani is made with a mix of dals 🙂 That’s how my family has always made it but I am sure each Indian family has their own method/preference.